The ability to select and apply makeup is a real art. To master all of its secrets, it is required to have a subtle artistic flair and patience, as well as accuracy and persistence. 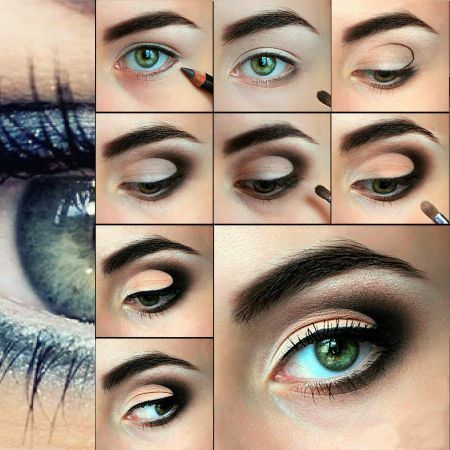 Here you will learn how to apply eye makeup that goes well with gray-green eyes so that they shine like stars and attract the attention of others. After all, the eyes are what people tend to focus on first. How to do makeup for gray-green eyes? Makeup for gray-green eyes contains a wide variety of options. To begin with, you must decide which of the two colors dominates your eyes: green or blue; this is the color you want to highlight and emphasize. Gray-green eyes are volatile; this very unusual quality should be used. If you want to emphasize the unique green color of your eyes, use brown, copper, gold, or beige shades. If you intend to focus on the noble gray color, it is best to stick with cold, steel-gray shades. In any case, plum, aqua, and olive shades will look interesting. You can also try a bright shade of pink. The color pink, while demanding, is well-suited for gray-green eyes. First, apply the lightest shade as the base, and then onto the central part of the upper eyelid. Finally, apply the darkest color on the outer corners of the eye. For gray-green eyes a brown contour pencil or eyeliner is perfect and will give your eyes a special depth, brightness, and expressiveness. The same can be said for eyelashes. Brown mascara is frequently used in makeup for gray-green eyes. Although black is not very suitable, everything is individual. The main thing is to not overdo it and comply with the measure and situation. Daytime makeup should be more discreet and natural. Makeup for the evening is better suited for something a little more intense and bright. With a bit of practice, you too will be able to create any image you desire. We wish you success in this endeavor! Like the article «Makeup for Blue-Green Eyes»? Share it with friends!